I have some nice coupon codes this month for the companies I like to talk about. If you have any questions about these companies or curriculum they produce, go ahead and ask me. We have either used or are using something from every one of these fabulous companies. I just love homeschool companies that are doing things well! If you've been curious about Illuminations, Bright Ideas Press' all-inclusive curriculum, you will be happy to know that the prices on Illuminations have been drastically reduced. This is a really great program and plan, one that I am familiarizing myself with to use next fall. We loved using Grapevine Studies last summer- no need for any drawing ability at all because you'll study your way through the Bible using stick figures! Grapevine appealed to my 15-year-old and 4-year-old alike. Use code MARCH12 to get 20% off. Simplified Dinners = lifesaver here. Really. Not only does it do the dinner planning for me, once I purchased the book, I was also given a folder for my Evernote and everything is there, too. I had to meal-plan on my phone last week and I tell ya, that Simplified Dinners folder on Evernote saved my behind! There's a gluten free/dairy free version, too (that's the one we use and love). Use coupon code SPRING for 30% off, March 6, 7, and 8th. 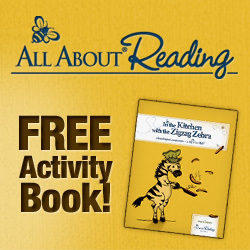 Lastly, you can get a free activity book for your learning reader and see if you like the All About Reading program at the same time.